Ok, so I wasn't really drunk when I twittered that but I sure was buzzed. I was at a friend's housewarming gathering and this cute little thing caught everybody's attention. 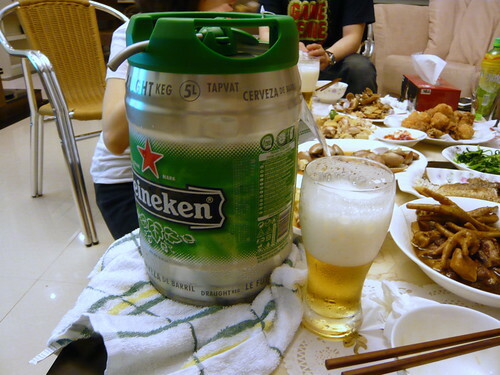 It's a 5-Litre Heineken keg. It's a toy and it's got alcohol! Anyway, trying to get beer out of it was tricky as we spent a good number of minutes trying to figure out how to install the nozzle. And when we eventually got it in, we spent another good number of minutes trying to figure out how to pour a beer that is not 90% foam and 10% beer. I guess practice make perfect and by the time we finally gotten the knack of getting a pour of 60% beer and 40% foam (very good liao lah! ), the keg was empty already. Man, was I really bloated with all the beer bubbles inside me that if I were to burp, I'd swear the beer would come out as well. I'm sure you can bluff better. Chocolate Gal: You don't claw me I thank sky thank floor liao. Mmmmm... nails are cut already so cant scratch.. I can always borrow someone's cat to scratch scratch, if u really want... u sadist..
Chocolate Gal: Please read up on the dictionary. You are mixing up sadist and masochist.